Researching local history always throws up more questions than answers. 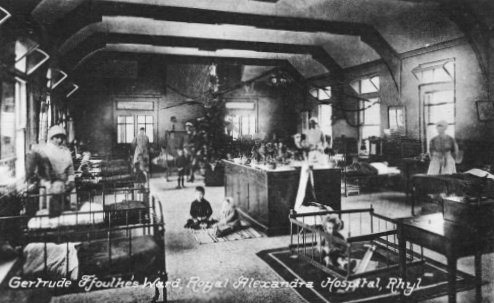 To read about the beginnings of the Royal Alexandra Hospital click on “A Seaside Nursery for the little ones of our land”. As a result of this research, obvious questions spring to mind, such as: who was Archdeacon Ffoulkes, why did he decide to set up a children’s convalescent home in Rhyl, and who was Gertrude Ffoulkes? Those of us who were either patients or staff at the “Alex” will remember “G.F.” ward (Gertrude Ffoulkes) but who was she? Why was a ward named after her? 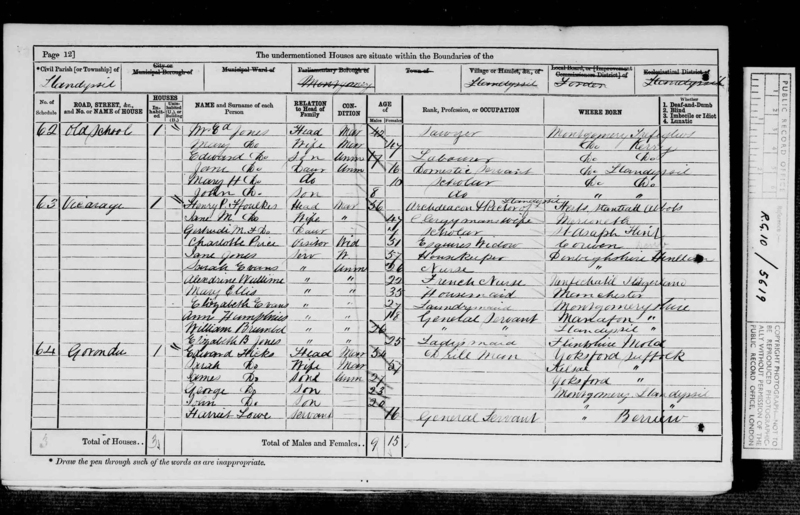 The 1871 census shows Gertrude Mary Frances Ffoulkes, aged 7, living with her parents the Archdeacon and Mrs Ffoulkes at the Vicarage, Llandysil, Montgomery. Notice that Gertrude’s place of birth St. Asaph. Gertrude was their only child, and was born to them at the relatively late ages of 49 and 40. In their household they had several servants: a housekeeper, a laundry maid, two general servants and a lady’s maid. Interestingly they also employed two nurses. Was Gertrude a sick child? Is this what inspired the Archdeacon to set up a home for sick children? Gertrude’s father was the Rev. Henry Powell Ffoulkes, Archdeacon of Montgomery, Canon Residentiary of St Asaph and Rector of Whittington, near Oswestry. Archdeacon Ffoulkes established the Children’s Convalescent Home in 1872, which later became the Royal Alexandra Children’s Hospital and Convalescent Home. Gertrude was 12 when she died, her death certificate gives no clues as to whether she was chronically sick. The cause of death is given simply as “inflammation of the bowels”. The photograph below shows the Gertrude Ffoulkes ward in the Royal Alexandra Hospital. 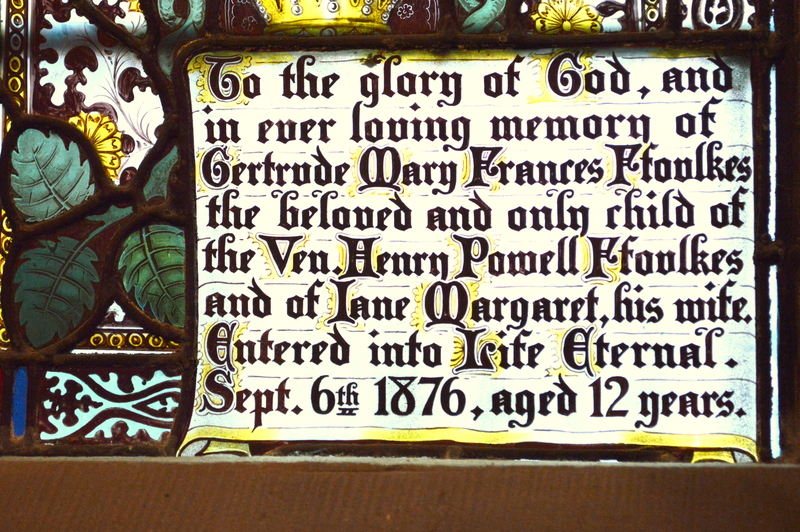 Archdeacon Ffoulkes died ten years after Gertrude, in 1886, and was buried with his only child at St Asaph Cathedral. photograph shows a part of the stained glass window of the Chapel at the Royal Alexandra Hospital.